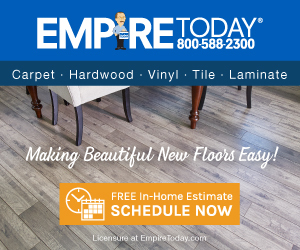 Empire Today - EmpireToday: Worst flooring company I've dealt with. First, let me start off by saying I am a trained insurance adjuster, 14 years in the business. I have NEVER dealt with a company which has provided such poor customer service and poor installation. I am trained on the specifics of how to estimate, install, roll, and stretch a carpet. So, imagine my surprise when my mother calls me and asks me to come and take a look at her carpet which EmpireToday installed. She was already pissed because they called the day of the scheduled installation last week to cancel on her 20 minutes before they were supposed to be at her home. When I originally looked at the estimate, I told her it seemed a little shady because there was no square footage listed or pricing per sq ft.
She wanted to go with them because of the advertised discounts. Even with the discounts, I told her the pricing seemed high. I inspected the 3 bedrooms. Whoever the installer is has no idea how to roll or stretch a carpet. There are air bubbles underneath the carpets in every bedroom. Almost looks like a buckled hardwood floor underneath the carpet. Too bad they have NEVER had hardwood. In addition, the seams in the closets were not tacked down at all. I can literally take my hand and lift up the carpet in all of the closets. In my oldest son's bedroom, the carpet is not even the same width as the closet, and there is a one inch gap in the front of the closet with no carpet. The smallest bedroom which is about 11 x14, they decide to roll the carpet by the 14ft side, so there is a seam right before the closet and another seam in the closet. Who does that? If you don't know, carpet comes in 12ft or 15ft rolls. So if you have a 11 x14 room, you roll the carpet on the 11 side w the 12 ft roll, you roll it 14ft long and then into the closet. There should be NO seam in a room like this. NOT ONE! My parents room which is about 22x14, they decide to again, roll on the 14ft side. So my mom has a 22ft seam going down the side of her bedroom, and then it stops. Looks like they ran out of carpet, patched in another piece, so it looks like a quilt. Common sense would say, roll 2-12ft pieces on the 22 ft side. There would be one seam-in the middle and if they are good installers, it should be barely noticeable. These pieces could have gone right into the closets as well. Very little waste and few seams. Any good carpet installer knows this. The entire carpet needs to be replaced now because the job is sooooo incredibly bad. They are holding up further construction my parents are trying to do because NO ONE WILL CALL US BACK. It's been 48 hours and we have not heard from a soul. I even called the BBB and asked how the *** did they get an A+ rating based on the number of complaints I have read from this site, other sites, twitter, and facebook. The gentlemen was very helpful and led me to believe they are going to look into this further. I told my mother if we do not hear from anyone by the end of the day, we are calling our local news investigative reporter to look into it. I am just in aw. I have worked with hundreds of flooring installers over the years and have never seen a job quite this bad before. It really is awful. Wish I could upload photos for you all to see! Review #282021 is a subjective opinion of acire007.